MORRISTOWN, NJ. The great outdoors awaits! Discover the best spots to sled, ice skate, cross-country ski, snowshoe, and more, all right here in Morris County. Make the most of this season, and experience the exciting programs and winter activities the Morris County Park Commission has to offer. 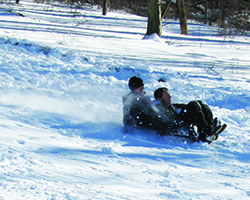 Grab your hats and gloves, and head to the Doe Meadow Hill at Lewis Morris County Park for an afternoon of sledding down one of our largest hills. 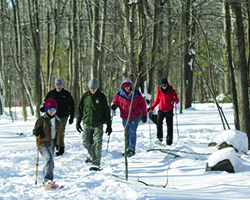 Cross-country ski through the beautiful trails at Loantaka Brook Reservation in Morris Township and Hedden County Park in Randolph Township, or lace up your skates, and glide across the ice at the flooded, in-line skating rink at Central Park of Morris County in Parsippany. Looking to try something new? Experience the unique and exhilarating sport of snowshoeing. Join a guided snowshoe adventure at Pyramid Mountain Natural Historic Natural Historic Area in Montville Township on select Sundays in January, February, and March. Enjoy a brisk afternoon exploring the beautiful winter scenery and looking for signs of wildlife - all while getting a great workout! Experts are on hand to help fit your snowshoes and answer questions. If you are an experienced at snowshoeing, or prefer to venture on your own, there are one-day snowshoe rentals available at Pyramid Mountain Natural Historic Area as well. If indoor ice skating is more your style, check out Mennen Sports Arena, the best three surface ice arena in the area. Don’t have ice skates? No problem, both hockey and figure skates are available to rent. Embrace one of New Jersey’s most cherished seasons this winter. There is so much fun, excitement, and adventure waiting for you! For more information, including a full list of outdoor recreational sites and activities, visit morrisparks.net.